When out and about, whether in the ‘wild’ or wandering through ‘civilization’, there are several plants useful to be able to recognize. The first is Plantain. This common weed came with the European colonists and is everywhere. 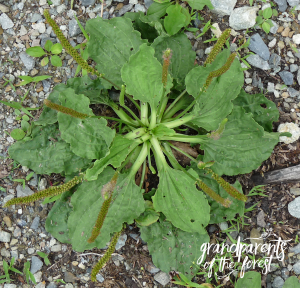 There are two species: Narrow-leaf (Plantago lanceolata) and Wide-leaf (Plantago major). They both work equally well. This is a good plant to be able to recognize when you get stung by an insect. Pick a couple of leaves, chew them up and apply the chewed pulp to the bite. The saliva is important in activating the healing. The next plant it would help to know is Jewelweed or Wild Touch-Me-Not. Its second name comes from the explosive way the fruit shatters to spread its seeds. There are two species of this plant also: Spotted (Impatiens capensis), with orange flowers and Pale (Impatiens pallida) with pale yellow flowers. Both species get their more common name, Jewelweed, from the silvery shimmer a leaf submerged in water displays. This succulent plant is often found in moist soil, along streambeds, forest edges and roadsides. It is also often found near Poison Ivy – which is a good thing because Jewelweed is an antidote for Poison Ivy rash! Just pick some leaves and stems, crush them up and rub the pulp on the exposed skin. 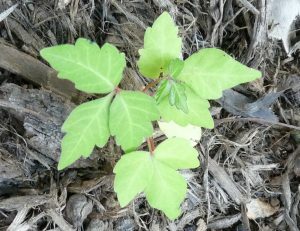 The next plant is useful to know so you can avoid it: Poison Ivy (Toxicodendron radicans, formerly Rhus toxicodendron). It is characterized by three waxy-leathery leaflets and a very ‘hairy’ vine stem. It has white flowers and berries and the leaves turn a beautiful red in autumn. 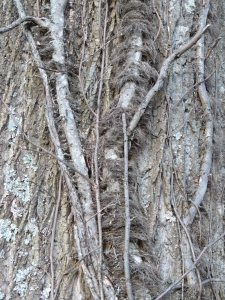 The winter-dormant roots and long-dead vines will still have the urushiol toxin, so it is good to know what they look like also. The roots tend to be orangish-yellow with many side rootlets. If you rub against this plant, wash with cold water and LOTS of soap with scrubbing as soon as possible. 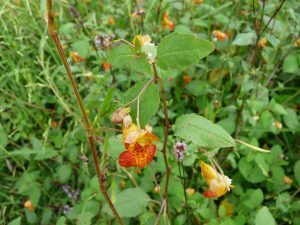 If a rash develops, rub the rash with Jewelweed. 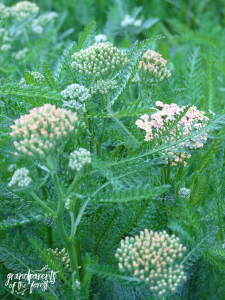 Lastly, Yarrow (Achillea millefolium) is a good friend to have around. Put a poultice of yarrow leaves and flowers on a bruise to help it heal quicker. And Yarrow leaves will stop bleeding from wounds like cuts, punctures and scrapes. You can dry the fine feathery leaves and carry them with you in an emergency first-aid kit. When going out, know your friends. Have fun and be safe. I (Deb) was born in 1960 and grew up during a very unsettled time in the world. I remember watching news of the assassinations of the Kennedys and Martin Luther King on our black and white TV with only two channels. The nightly news repeatedly featured Vietnam, peace rallies in Washington DC and on my mom’s birthday, 4 May 1970, the horrific massacre at Kent State University occurred. My father required me to sit down and watch as Nixon resigned. He said I would never live to see another event like it in my life. Vietnam created an undercurrent of anxiety in our house. I had older draft-age brothers. One brother was college bound and my other brother drew draft number 8 and enlisted, only to have the draft abolished a few weeks after joining up. As he left for his Marine basic training in NC, I sat under the dining room table with our collie crying and trembling. I didn’t know if I would ever see him again. Nightmares started. I would often wake up and find myself in tears outside my parent’s bedroom door. One recurring dream haunted me. Soldiers shooting the Vietcong would come alive as little miniature people and move around the edge of my bed, coming closer and closer. I would wake up with a scream. I doubt my parents understood the depth of fear that was in my heart. Probably, were to read my account above, they would dismiss it. I can assure you, it is etched deep in my heart. I am concerned about the children growing up in our politically chaotic world these days. The too-often repeated violence of terrorism and shootings make us all a bit on edge. Children sense this and can take it on in ways that we can hardly imagine. Pay attention. Is your child showing any signs of stress? Has their sleeping pattern changed? Are they more moody? Do they cry more easily than usual or get upset about small things? Perhaps they are taking longer naps? Your child may not, probably will not, be able to verbalize their stress to you but if you can keep in mind that the overlying stress of the world around them may be at the root of some of the changes in their behavior, you can begin to address it. If you are seeing patterns of stress in your child, of course, you can talk to them about it. Just naming the emotion they might be feeling may be able to lift some of the burden from them. There’s no need to go into deep conversations with them. After helping them to name their emotion, assure them it is a normal response and reassure them that you are there for them and that you are protecting them. Your consistency of care will go a long way towards easing their distress. Providing a ritual of protection may also be helpful. You may want to use dried yerba santa and/or yarrow and sprinkle it around their bed while saying prayers of protection and peace. Or perhaps have them carry some with them throughout their day, just a little bit in a pocket. Rituals create a sense of comfort and provide a pattern in their life. It’s something they can come back to time and time again. And these two herbs do help. 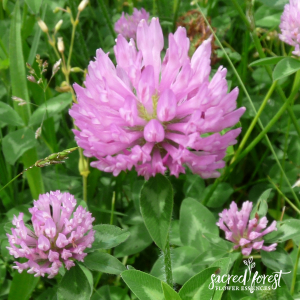 It may sound like ‘magic’ but these herbs have been shown to have a protective energy. 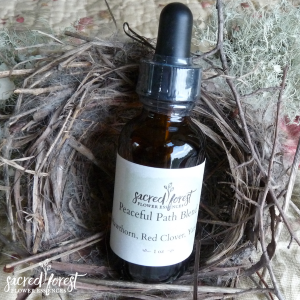 I have also made a special flower essence blend called “Peaceful Path”. It’s a combination of yarrow (for protection), red clover (for shock and trauma) and hawthorn (for healing of the heart). This combination is helpful for both children and those of us adults who are feeling the stress of these times. You can purchase this blend here. If you’d like a package of both the essence blend and one ounce each of dried yarrow and yerba santa, please go here. I want to remind you dear parents, it’s crucial that you take care of yourself also, not just for your own sake but also for your child’s sake ~ so that you are able to support them. We all process things differently and need different aids at different times. Perhaps you need to talk things through with like-minded people so you have their support? Perhaps you tend towards activism and need to rise up? Perhaps you are more contemplative and need to go within? Honor your differences and take your needs seriously. Tend to your heart. Dear friends, let us also remind you to return to Nature during this time. Take a few extra minutes to observe the many miracles in our world. Sit quietly someplace where the peace of Nature – the sights, sounds and smells – can calm, sooth and heal. And remember, when you are looking at the sunset, clouds, sun or moon, you are deeply connected to everyone else noticing them as well. We are bound together by this world we live in and we can find respite in her arms. Schools are finishing and it will soon be officially Summer. Graduations and weddings may be filling your calendar like they are ours. Our youngest daughter is graduating from college next week! We are thrilled to celebrate with her and to have reached our own milestone ~ all our children have safely made it to adulthood and are thriving and bursting with life. We can’t say this has been an easy journey but it certainly has been fulfilling. And… we remember summer vacation very well. The children are excited, happy and full of energy. Butterflies and lightening bugs seem to gather around them, don’t they? How do you keep them busy and yet give them space to rest and to grow? How do you yourself have space to rest when you are now busier? Allow them access to the forests, fields and streams without any toys, instructions or classes. Just let them explore, play and use their abundant imaginations. Are you familiar with Jon Young, prominent outdoor leader and guide? What’s the secret of his success with summer programs? As soon as the children are dropped off, he and his fellow guides let the children run to the woods to play independently. Of course, they are near by to watch out for the children’s safety and to answer questions but mostly, the children are encouraged to roam and play together ~ with sticks, in the mud, on tree roots… whatever they want. They do games, rituals and storytelling at certain times but Jon says the bulk of the day is spent in independent play. We wanted to take this chance to remind you that you don’t have to entertain or schedule your children every moment of every day. They will thrive with space to go adventuring and exploring and they will learn more than you can even begin to imagine. And the apple-trees cover’d with blossoms, and the fruit afterward, and wood-berries, and the commonest weeds by the road…. And you, dear parent or grandparent, what of you? Can you too go to the woods, lean your back against a tree and listen to the birds? Can you take moments to just feel the breeze against your skin or to watch a sunset with your child? If you need some assistance in slowing down, we’d like to introduce you to two green helpmates; oat straw and the flower essence of trout lily. ~ Oat straw can be made into a delicious infusion for whole family. Buy it in bulk at your favorite health-food store and put one cup in a quart jar. Pour boiling water to the top of the jar, cap it and let it sit for at least 4 hours or preferably overnight. Of course, you can let it sit for a shorter time and it becomes a pleasing tea. Drain off the infusion and drink it throughout the day or under the tulip poplar tree. Oat straw is calming and as you drink her, you are changed. 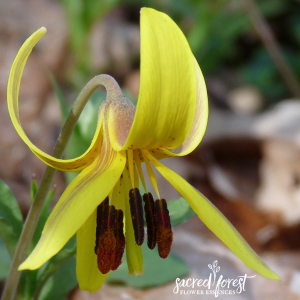 ~ Trout lily flower essence offers total peace. She invites us to witness her harmonious state through the way she moves in the breeze, bows her head in humility while also being vibrant and bright. She is continually grounded in the earth with her strong spotted leaves. When we take this essence, we are able to access this same balance and harmony. Of course, we need not look to Jon Young, Walt Whitman, scientists or Grandparents of the Forest to ascribe to a certain way of being in Nature because deep inside of us there is a place that remembers the need and desire to surrender to the beautiful tactile experience of being in Nature. I’ve been fairly silent lately. Sometimes, I just need to ponder things before I find my voice and if I try to force myself to speak too early, things come out garbled. Does that happen to you? Last night, in the middle of the night, as often happens, I was thinking about you mothers and caretakers and reflecting back to the days when my young children needed so much from me. Now that I am grieving for those days (yes, it’s a big adjustment having an empty house), I often wonder how I could have been more present for my children in the midst of the chaos of getting them to school (or homeschooling them), feeding and tending them as well as trying to keep some order in the house… and trying have some kind of a life outside of these family responsibilities. At the time, I was practicing mindfulness meditation and doing qi gong daily. They were my touchstones and helped me stay attentive. But now, standing back from it all a few feet (or should I say a few years) what I really needed were heart fullness practices. I ask myself, how could I have kept my heart open more? I had been thinking that much of the answer to this query is in slowing down but last night, in the dark of the night, I realized more fully that it’s not just in slowing down and seeing. It’s not just in connecting. And I certainly don’t think it’s possible to be ‘present’ constantly. What came to me in the wee hours was a step beyond keeping my heart open to my children: I remembered the importance of being openhearted – with myself. Oh, that I could go back to those days fully loving myself. I don’t mean loving myself like with a verb, as in self-care ~ having retreat time for myself or getting my nails done, or taking a bath every night ~ as wonderful as those things are. I mean having a gentle, tender and accepting presence with everything I experienced and felt and did back then. I remember the days of reading parenting books and trying so hard to be all things to my children. And when I failed, I became my own drill sergeant. I’d schedule more, I’d try harder, I’d lay awake at night running through my day and trying to reshape it so that I would be or had been a better mom. Even slowing down would become a goal, a ‘should’ and then, of course, it could be something I could fail at. I hardly ever held my own heart. I was rarely kind to myself. So I ask, are you able to hold yourself and all of your beautiful womanly emotional ups and downs with generosity of spirit? Imagine yourself, as I did in the middle of the night, lying on the grass with your hand on your heart while children run around beside you playing tag. Imagine a little heart drawn in the center of your hand and one on your child’s hands. She’d stop playing every once in a while and touch hearts with you – hand to hand. 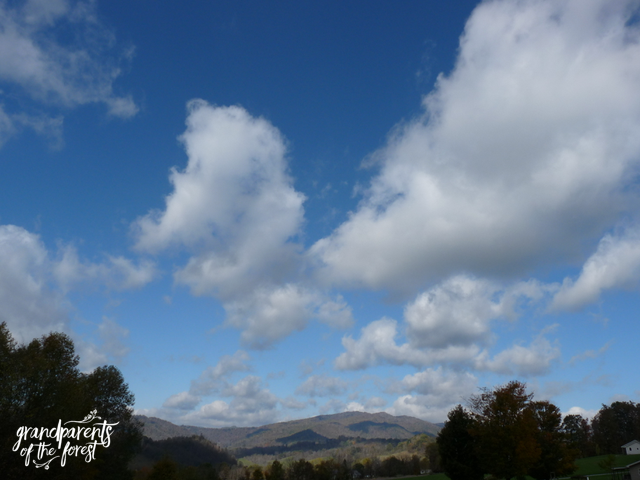 Nature is helping you to remember your preciousness. The sun is shining through the maple leaves and there’s a warm breeze on your cheeks and somehow, you know as if never before, you are being held. Feeling the tree roots underneath you ~ you feel a firmness and connection to the earth that helps you to remember you belong. Nature’s beneficence surrounds you. 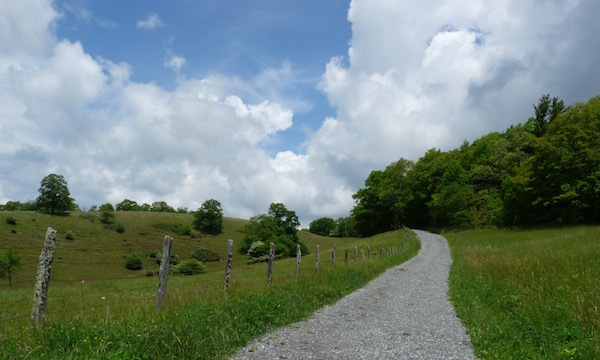 How might this good earth show you the way to self-mercy? How might it teach you about being enough? Who amongst the flowers might show you the way to letting go of perfection? Which tree might show the way of a strong heart – one formed in total acceptance of all that resides and lives inside of us? I can only imagine how having my own inner peace might have affected my children when they were young. Now, I am using spacious heart practices with the hope that my children can feel the difference across the miles in their adult lives. You, dear parents and caretakers, can stand in this fertile place of loving kindness and let everything else go. No need to do anything any differently. Just remember, place your hand on your heart some times and look to the plants, rain, sun, moon and the seasons to show you the gentle way. If you are interested in Deb’s mentorship program, please go here. 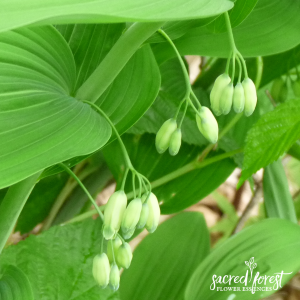 For more information about how Solomon’s Seal flower essence might assist you, read our description here. There is a principal in ‘herbology’ that effectively says if you need it, it will appear… even if you don’t realize you need it. We experienced this phenomenon several times on the farm. 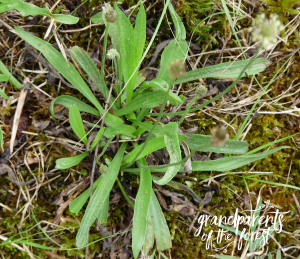 This year, the Ground Ivy (Glechoma hederacea) (also known as Gill-over-the-Ground) has REALLY increased it presence in our lawn and in the field up the hillside behind our home. 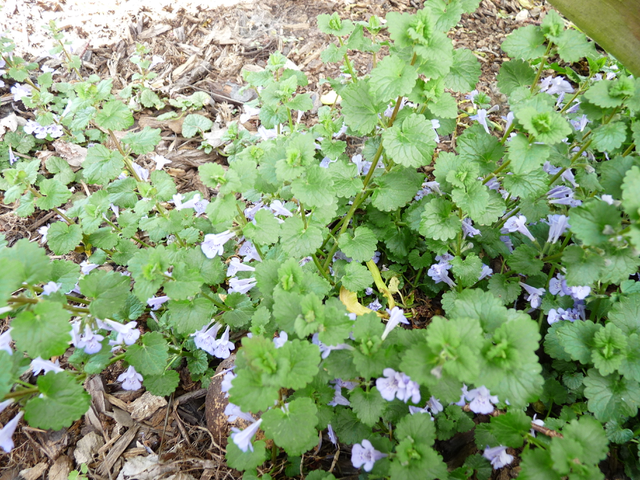 With its square stem and stereotypical flowers, Ground Ivy is definitely a member of the mint family. So the obvious question is: Why do we need it? What can it be used to treat? One thing we knew is it has been used as a treatment for cancer. As far as we know, we are healthy in this respect. Just last week a post was made on Facebook mentioning it was good for tinnitus. After verifying this use in other sources, we tried it. (For definitive identity assistance, you might visit the Identify that Plant site. Harry has had tinnitus for years… perhaps from hunting as a child with his Dad and Grandpa, perhaps from too many loud rock concerts during his college days… who knows. Harry’s tinnitus stepped up a notch recently, from the constant high-pitch squeal or whistle to a noise that sounded more like spring peepers chirping… non-stop. 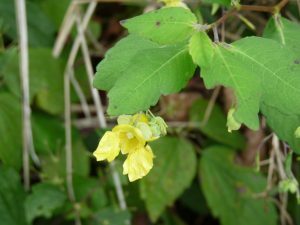 The recommended treatment is to drink a Ground Ivy infusion. 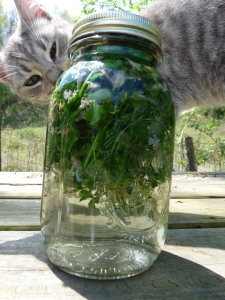 An infusion is made by pouring boiling water over an ounce or so of plant material and letting it steep in a sealed container (like a capped Mason jar) for at least 4 hours, but preferably overnight. Then strain the plant matter out and drink a cup or two of the liquid during the day. After the first quart of infusion the peepers were silenced. The squeal remains, but slightly diminished(?). Here’s hoping for further improvement with more infusion! 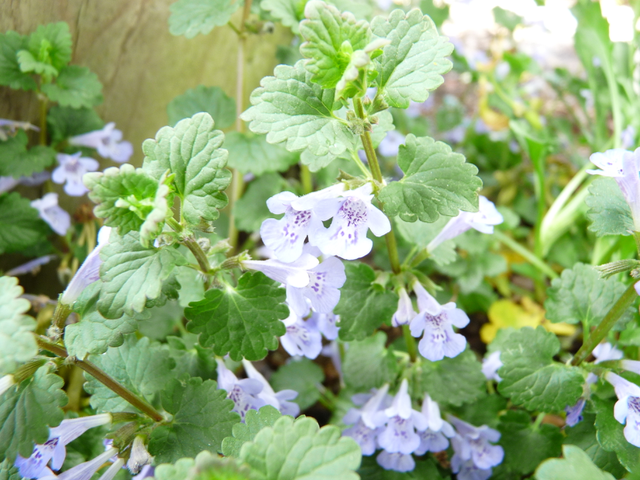 Luckily, the Ground Ivy will be available all summer. I had a horrible stomach bug this week and as I laid in the bed clutching my belly I thought of all the times my children had stomach cramps, vomiting and nausea and how utterly helpless I felt. Is there anything much worse than seeing our children suffer and not knowing how to help them? I thought I’d take a moment and share a few things that relieve some of the discomfort of stomach bugs. These tips are especially helpful for cramps and vomiting. This is a miraculous treatment for vomiting and stomach cramps – and it’s so very easy. It works by sending heat into the hollow organ of the stomach which aids the cramping. Heat 1/2 cup of natural sea salt in a skillet. It takes about 5 – 7 minutes to get it very hot – but not burning. Pour the salt into an old sock. It’s easiest to do this if you have two people – one to pour the salt and the other to hold a funnel that goes directly to the sock. Then tie it shut. If you need to, wrap the sock in another layer or two of soft fabric to prevent any burning. Make it as warm as possible. Apply it right on the stomach – not over the whole belly. Keep it on as long as needed. Hopefully, it will bring enough relief that they’ll miraculously fall asleep. You can reapply it (reheating the same salt) every thirty minutes. Keep the salt in a plastic container in the medicine chest along with a sock so it’s ready every time. When children (or any of us) have vomiting and/or diarrhea it’s easy to become dehydrated and lose essential minerals. It’s very easy to make an electrolyte replacement drink at home with very common kitchen items. Combine all ingredients and have them take sips or up to 1/3 cup every half an hour or so. Please note – many years ago, I learned from my Chinese Medical Qi Gong Teacher that it’s necessary to have all beverages be at room temperature – or just slightly warm – when one is vomiting. Cold liquids (and especially ice) actually make the stomach spasm and they worsen the condition. Who doesn’t like ginger ale when their stomach hurts? Ginger is an amazing aid for chills, sore throat, flus, low fevers, coughs, nausea, vomiting, cramps, gas and stomach ache ~ making it a valuable ally any time your little one is ill. Instead of buying ginger ale at the store, make it at home. This ginger ale has a higher volume of fresh ginger than store bought so it has more medicinal value. One word of instruction – ginger is warming so if your child has a high fever, it is not the best choice. At that point, you would do better with a cooling herb rather than a warming one. Yes, it’s true, not every herb and food is good for everyone on every occasion. Always trust your instincts and your child’s as well. The road to good health comes from deep knowing and trust in ourselves, first and foremost. Bring 1 teaspoon of grated fresh ginger and 1 cup of water to boil. Turn down the heat to low and simmer for no more than 5 minutes. Remove from heat and let sit covered for 10 to 20 minutes. Add 1/2 cup carbonated water. Stir in honey (if your child is over the age of 2) or sugar. Go lightly on the sweetener. Ginger is tasty all by itself. For illness – drink 1/4 cup every 2 – 3 hours then decrease day by day until the illness is gone. For regular drinking, because this is so medically potent, limit this homemade ginger ale to 1 to 2 cups a day. Ginger can also be used as a compress on sore muscles and body aches. Boil coin sized slices of ginger in a quart of water for about 20 minutes. Let cool to a temperature that is a bit warm, or about room temperature. Put a soft cloth in the water, wring it out and place it on the child wherever she is hurting. Or if you like, pour the gingered water into a bath and let the child soak in it. It will soothe their aching bodies. I hope these tips help you next time the ‘bug’ goes around! Each flower, shrub and tree that grows holds sacred gifts for us. When we open our hearts to connect with this mysterious and pristine world, we are healed. Sometimes healing comes from merely being in nature; feeling the sun on our cheeks, listening to the birds’ serenade, feeling spring water caress our feet or absorbing a sunset. When we are in the forest, we take in a multitude of goodness ~ thousands of plants grace us, the air we breathe fills our lungs with the oxygen, aromas and energies they produce. This is our true home and when we open our hearts to this beautiful world, our spirits can rise and our troubles disappear. As we are peaceful and receptive, we heal and return to our own original essence. 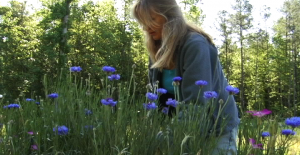 Flower essences aid our ability to receive healing properties from the Living Soul of Nature. Each flower, every tree and every shrub holds a different gift of healing. Each one is uniquely imprinted with its signature, just as we are. The flower of the plant contains the concentrated essence of the plant. By taking the essence of the flower, your soul aligns with the particular gift it offers you. 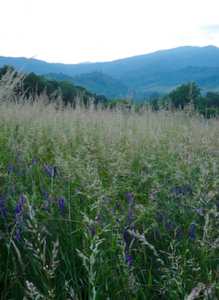 Harry and I frequently traverse many paths by our Appalachian home and have come to know these flowers as friends. We know where to look for them, when the plants first appear in spring, when they bloom and when they shed their seed. 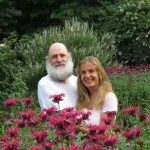 We believe that harvesting the few flowers needed to make this sacred medicine is most aligned with right stewardship and relationship with Nature. Our flower essences are effective because they are made with gentleness, devotion and respect. We barely disturb the plants. We ask them if they would like to be made into an offering to us humans. We wait to sense an answer to this question. If they agree, we pick them gently and bring them to the clear sunlight where they transfer their energy to spring water. Next we add a small amount of brandy to the energized water, which now holds their essence to preserve the medicine they have given us. Finally, the medicine is hand diluted to the proper potency into bottles to make their way to you, dear friend. Each step is a prayer. Our intentions are aligned with healing and love for you. Yes, we make a sacred covenant with each plant we use so you will truly be nourishing yourself with a bit of heaven.